Thousands of visitors flocked to Port Hope this past weekend for the annual Float Your Fanny Down the Ganny River Race, and our Trinity College School students were there to lend a helping hand. For the third official Service Saturday event of the school year on April 13th, beautiful weather meant that attendance at the race was amongst the highest ever. Nearly 30 TCS students were downtown, serving in two capacities. One group helped to organize events at the “Kids Zone” set up along the banks of the Ganaraska River. Students ran a face painting station and helped children enjoy the bouncy castle. Smiles abounded as our students and the young people they were working with all had a great time! Students also assisted with administering surveys at the event for on behalf of the town. 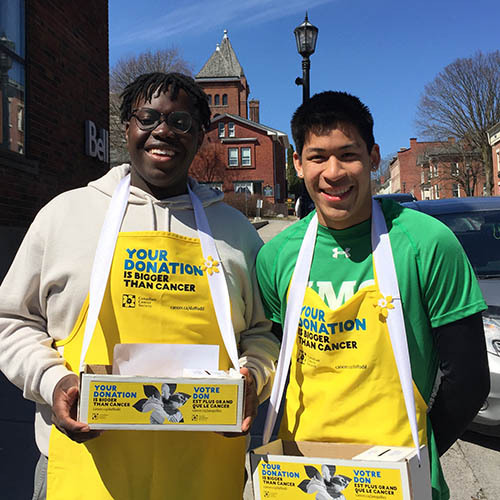 Another large group of students volunteered for our longtime community partners, the Canadian Cancer Society, distributing daffodil pins and collecting donations to support the society’s efforts to raise awareness and find a cure for cancer. With so many people in the downtown core, it was a busy day for all of the students serving there and a wonderful chance to get to know our community and represent Port Hope with pride. Over in Cobourg, another group of students had fun working at a charity dog bath event at Paulmac’s Pet Valu store. The volunteers always have a great time meeting the dogs, and this fundraiser was particularly special as it was in support of the Lions Foundation of Canada’s guide dog program. While traditionally known for their role in assisting those with vision impairment, dog guides now help people in dealing with different forms of disability, including: seizure response, diabetic alert, autism assistance, hearing impairment assistance and general service. The guide dog program allows people with disabilities to experience greater safety and independence, and it was very fulfilling for students to be able to support this worthy program, while having a lot of fun in the process. Thank you to all of the students who participated in this Service Saturday event, and to the chaperones who made the day possible. While this was the final formal Service Saturday of the school year, there will continue to be opportunities for students to gain service hours and, more importantly, to experience the sense of purpose that comes from giving back. View the Service Saturday: April ’19 gallery for more photos.